After that rather negative title, I feel I should explain that I didn’t hate the movie at all. In fact I thought it was rather good. I especially think Carey Mulligan was as magnificent as usual – I’ve never come across anything quite so powerful on screen as her slowed down rendition of ‘New York, New York’ in the movie Shame. It takes a powerful actress to sink you to depressive weeping just by singing a cover of a song that’s played at weddings and bar mitzvahs. Most of the supporting cast were also excellent, there was some great dialogue and a lot of the detail ( such as buses with external spiral staircases) was well presented. But I digress, immediately. The movie ends with a sense that the sacrifice that the character made at the end was what was needed, and turned the tide – leading to what women had been fighting for for so long – the vote. Job done. Vote got. Time to have a nice, well earned rest. That’s all very well, and getting the vote was a huge achievement for equality, but it was not the finish line. It was the first step. A bitterly fought for first step, for which many thousands of women were tortured (far more horrifically than was touched on in the film) and gave their lives for, including those that didn’t actually die. But the fight for gender equality is far from won. I wanted to walk out of a movie called ‘Suffragette’ feeling energised, motivated tostart doing more active deeds in the name of equality. I wanted to be inspired to find a better way to live this life. But the movie gave the sense that these martyrs had already done what need to be done – in England and the West at least. That leads me to the one point the movie did make about modern day inequality, which I feel was badly played, considering the other hot political agendas it invoked – which complicated and muddied the issue. I’m well aware that Saudi Arabia is appaling when it comes to women’s rights, but I believe in leading by example, not sniffing disdainfully at those worse. This sentence elicited a wave of snickering laughter in the movie theatre I attended, giving the impression that the audience were left patting themselves on the back and feeling smug about being so progressive in such a backwards world. There is so much left to fix, and it’s going to take a lot of energy, the last thing we need is people sitting back feeling superior. But let’s move on to why the movie was disappointment from a storytelling point of view. Recently I was lucky enough to stumble upon Cracking Yarns, the website of Allen Palmer, and from reading the excellent articles on that site, I have gained a much more detailed understanding about why some movies move us, and others don’t. Palmer talks about ‘Transcendent Stories’. 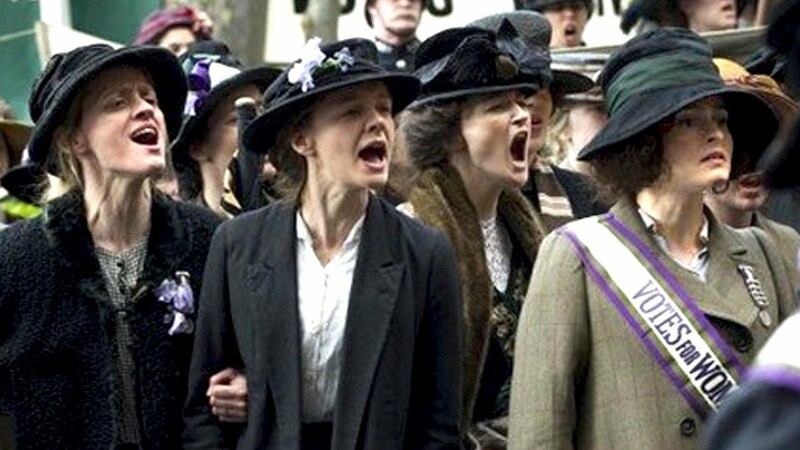 It’s impossible to feel the agony and ecstasy of the sacrifice in the climax scene of Suffragette, because the character who is making the sacrifice is not only not our protagonist, but she’s not even a strong supporting character. We’ve barely met her three times in the movie, and we know nothing about her personally. Furthermore, we don’t know what she intends to do, so we’re not invested in her decision making process. We don’t feel the agony of her choice. Certainly, that means that we are shocked when it happens, but surprise is easy – any cheap, crappy horror movie can make me jump. But make me feel anguish. Make me realise at the same time as the character the terrible price she has to pay, and realise that there is no other choice – that’s hard. Suffragette didn’t get anywhere hear it. Suffragette failed to meet my extremely high expectations, but I’m still glad it was made, because I believe it makes a big contribution to keeping the war for equality in the front of people’s minds. But I guess I’m still waiting for the feminist movie that gets me leaping out of my seat and punching the air. If you are a real feminist go to Saudi Arabia and start organizing the women there. Don’t be a winger while in the USA where is easy to be a feminist, darling! Yay! My first feminist detractor! This isn’t even the first time I’ve heard that argument this month. Agreed the problems of gender inequality are much worse in some countries than others, but that doesn’t mean we should ignore problems at home. (Which is the UK for me rather than the US, as it happens.) A war must be fought on many fronts. In any case, the comment really makes it sound like you didn’t read the article, in which I address exactly why I disagree with the position that we should ignore problems in the West and focus on other countries, specifically Saudi Arabia.